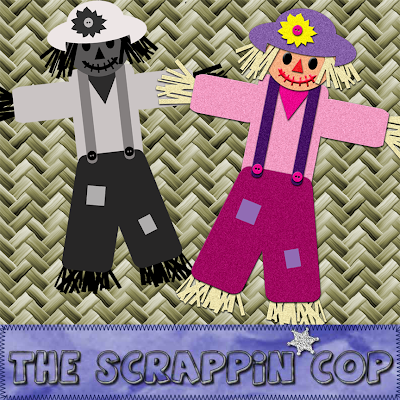 The Scrappin Cop: 2 for 1 CU Scarecrow Layered Templates! 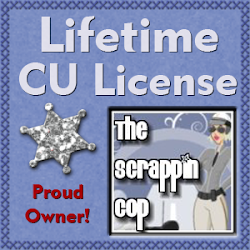 2 for 1 CU Scarecrow Layered Templates! I went into Hobby Lobby today and there was a whole wall full of little scarecrows for your door, yard, etc. They were so cute! And I couldn't decide if I should make a "human" scarecrow or a "crow" scarecrow. So today you get two different heads for the scarecrow! All the .pngs are included for the two looks and there is one .psd with one of the head "parts" hidden. You just need to decide which head you want to use and keep the other one hidden if you use the PSD file. I thought this would go well with your fall kits, and evidently scarecrows are hugely popular right now in the craft stores. I hope you like them!! I would also like to thank Gloria from 4shared with the comment about that overlay that was giving me fits. As soon as I read it I did a virtual "head slap" because I realized I didn't "desaturate" that one as it was already perfectly grey and I completely forgot to do it! So if you downloaded yesterday's overlay set you can discard the color info on that huge overlay and resave it to conserve disc space! Thank you Gloria! Oh my!! I was just looking for something to use in my Halloween kit!! Thank you so very much!! Love the scarecrows! TFS How lucky are you to have a Hobby Lobby store near you!?! LOVE LOVE LOVE the scarecrows! Thanks so much for another awesome template! 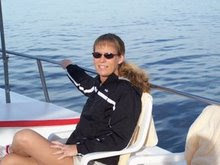 Don't worry about digital freebies - I'm sure like me everyone just checks your blog almost daily! oh my gosh, how cute! Thank you so much, I just downloaded frankenstein too. I just love these! Thank you! Your blog post will be advertised on the DigiFree Digital Scrapbooking Freebie search engine today (look for timestamp: 16 Aug [LA 12:00am, NY 02:00am, UK 07:00am, OZ 05:00pm] ). I especially love the crow. Thanks a lot! 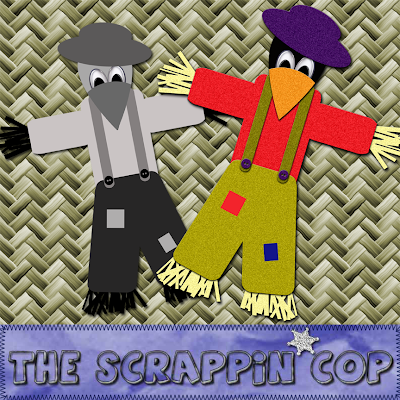 Your scarecrows are awesome, as are all of your designs! TFS!!! Oh for Pete's Sake! I worked for hours this weekend on a scarecrow for the Cornacopoeia of Color set and I just have just stopped by HERE! He is adorable!!!!! I love how you really can break down an image into usable shapes. I'm still working on that! I'm snagging ALL of your Halloween templates - they are wonderful! thanks a lot ! I love them, they are fantastic ! Finally found the lady who made the original scarecrows! lol. I saw a cute scarecrow, and another, and another, and a cute crow-scarecrow, and another... This just HAD to be a free CU somewhere, lol. So I looked at some tou's, and found you. Girl, you have AMAZING stuff here! So MUCH and all free and still here... LOVE it. I've downloaded all buttons and some bows, but I think... lol, Who am I kidding? I KNOW I'll come back later. I've had a nice look around your blog, and you make such pretty stuff, I want to thank you for sharing it all, and for sharing it for free, and for still having it all available. I love these! Can't wait to play with them! Thank you! Thank you . To all participant, please have a look at our updated contest post. The Scarecrows are great! Thanks for sharing!